WASHINGTON — Health and Human Services Secretary Tom Price said Saturday he will stop flying private planes on official business while an internal review of the flights is being done and that he welcomes the review. Price defended the practice of using private planes on Fox News. A spokeswoman has said Price tries to fly commercial whenever possible. 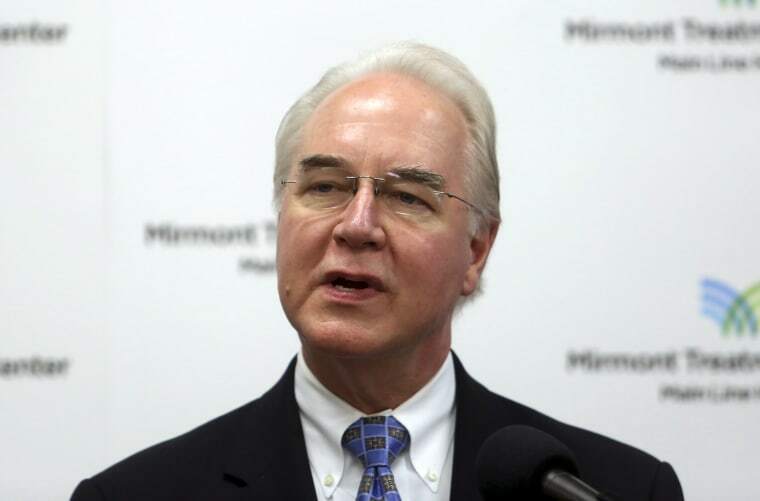 The HHS inspector general's office says the agency is reviewing Price's charter flights to see if they violated government travel regulations. Price, a former Republican House member from Georgia, chartered flights to a resort in Maine where he was part of a discussion with a health care industry CEO. That was according to a report in Politico. He also chartered flights to community health centers in New Hampshire and Pennsylvania. A spokeswoman said Price tries to fly commercial whenever possible. Price said all the flights were work-related and used for official business, including for trips related to the opioid crisis or the recent hurricanes. "But we've heard the criticism," Price said. "We've heard the concerns. And we take that very seriously and have taken it to heart." Congressional Democrats last week chastised Price, saying he wasted taxpayer money by chartering five private flights last week for official business when cheaper travel options were available. To Democrats, Price's expensive travel smacked of hypocrisy given President Donald Trump's campaign pledge to "drain the swamp" of money and influence in Washington and Price's long-standing criticism of government waste.